March 5th is National Absinthe Day, celebrating a green-colored spirit made from the flowers and leaves of the wormwood herb (Artemisia absinthium). Green anise and fennel seed give absinthe its distinctive flavor. 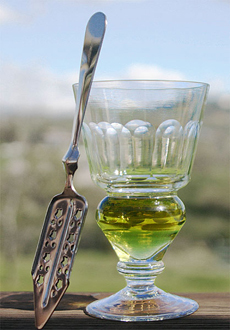 Absinthe has an anise-like flavor and a controversial past. Hey, isn’t absinthe the stuff that made Parisian writers and artists go mad in the 19th century? Wasn’t it banned in America? Read all about absinthe, and why it’s had a resurgence in America since 2007. Get your own absinthe glass and spoon. But watch out: absinthe is typically 124-proof—much stronger than any other spirits you’ve had lately.